I was born in April 1952 to Eveline (aka Peggy) and Ralph (aka Bob) Glover, a serving Royal Marine, in Deal, Kent. Very shortly afterwards, my father retired (at the age of 39) and bought a property called Ilfra Tors in Selsdon Vale, off Old Farleigh Road in Selsdon, which came with its own plot of land, and all the family, including my older, teenaged sister, Angela, moved in later that year. The property comprised a 3-bedroom chalet bungalow, with reception room, kitchen and bathroom, and a large outbuilding housing a garage with a room above it, and a workshop at the side. Long after my parents had died, older relatives told me that, shortly after moving in, my parents discovered a suitcase in the room above the garage containing a loaded revolver and basic essentials for a quick getaway, as if somebody had been hiding out there, possibly during the preceding war years. My sister has since told me that the suitcase apparently belonged to a Jewish family called Frankel who previously owned the house, and amongst the case’s other contents were books of handwritten notes. Mr Frankel was obviously very well-educated, and it was thought the family had escaped the holocaust and settled in Selsdon before eventually emigrating to Australia in order to move as far away from Germany as possible. The property and plot of land were situated on the slope of a valley, and if one walked along Selsdon Vale (an ‘un-adopted’ road leading off Old Farleigh Road), Ilfra Tors was the last building up on the left-hand side before reaching the wooded footpath which led to dog kennels on the right, and up to the top of a hill on the left into Addington Road. I recall helping Dad fill in the potholes with ash and clinkers from our fireplace, at the beginning of Selsdon Vale (which was a very straight road). My father co-owned and ran a small pig and poultry business on the land with his partner, whose surname was Bell. I recall Dad building sties for the pigs and coops for the chickens towards the bottom of the slope of the valley - the opposite side of the valley led up to what we used to call ‘the bird sanctuary’. I also remember as a tiny tot accompanying him in his lorry with pigs in the back to and from the livestock market in Guildford, and stopping off outside a pub on the Hog’s Back for probably a well-earned glass of cider for Dad and a bottle of pop for me! (On occasional family days out to the seaside, Dad would get out the family Jag!). An ice cream man and his van braved the potholes and made regular and very welcome visits along Selsdon Vale, stopping outside the bungalow to swap broken ice cream wafers and cones for our animals with Dad, in return for freshly laid eggs from our chickens. I was nicknamed locally ‘the Butcher’s Boy’ as my Dad was very generous with meat and produce from the farm for family, friends and neighbours when times were hard. I recall family members walking all the way from Wallington town centre to spend a few hours with us ‘on the farm’ before returning home again on foot, most probably laden with little parcels of produce under their arms. As for our isolated neighbours, the Willers family (I recall a mother and two young daughters) lived more or less on the opposite side of Selsdon Vale, and a man called Renouf grew and sold Christmas trees further along the road. From 1956, I attended Selsdon Primary School, which should have been a very short walk away for me because as the crow flies it was immediately behind the top boundary of our land. However, as a long line of trees and a small 1920s’ housing estate barricaded my exit, I was forced instead to take the long way round by walking to the end of Selsdon Vale and turning left! When leaving Ilfra Tors, turning left up the footpath, there was a solitary lamppost with an old abandoned Army pillbox nearby. Unfortunately for me, what could have been a ready-made secret play hideout in the woods was mostly unusable, being deep in mud and water for much of the time. Further up was another lonely lamppost, with a large Victorian house at the top of the path. A big horse chestnut (conker) tree grew at the end of Selsdon Vale where it met the footpath (which ran to the left and the right). The footpath is still there, but the entrance to it has slightly moved and, of course, it is no longer continuous since it has been fragmented by the cross-section of ‘new’ roads on the estate, although I understand that it still continues all the way up to Ashen Vale. At the lower end of the bird sanctuary, there was, and probably still is, a footpath. To the left could be seen lots of fox or badger mounds which had been burrowed out of the chalky soil and which were totally fascinating to a boy of my age. In the 1950s, Selsdon Vale was very much still in the countryside and, as such, was very dark at night, with dim lighting only shining out of the odd isolated house and occasional lamppost. I remember my teenage sister having to carry a torch with her as she stumbled along the footpath when returning home after dark. Very sadly, my father unexpectedly collapsed and died of a heart attack at the age of 46 in 1959 while working on our land. Unfortunately, my mother had to sell the house, land and his share of the business, and we all moved out later that year (or possibly early 1960) to a semi-detached house in Farley Road, Selsdon. My sister emigrated to America in 1966 (where she still lives today) and my mother passed away in Wallington, in 1971, at the age of 58. After our departure, the land at one end of Selsdon Vale beyond the footpath/bridleway was apparently bought by a golfer (rumoured to have been Harry Weetman, the resident pro at Croham Hurst Golf Club at the time), who then sold it on for redevelopment as the Forestdale housing estate. As for Ilfra Tors, I don’t believe it was ever occupied again and, some years after we left, the site and surrounding area were also developed for yet another housing estate. The present day Goldfinch Road, Peacock Gardens and Lapwing Close are the roads that now border my former home and land. 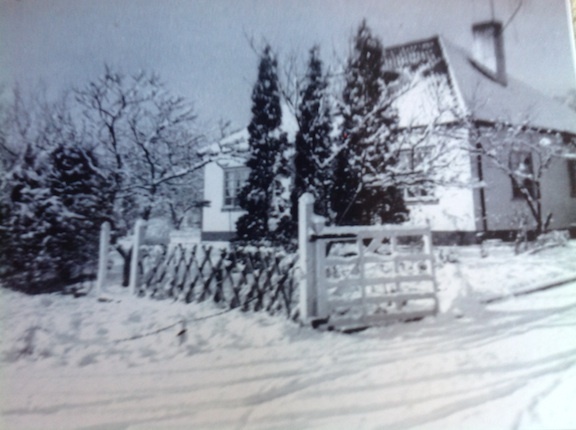 Our house, Ilfra Tors, under a blanket of snow, sometime during the 1950s. Walking out of the wooden gate, straight ahead was the bird sanctuary; to the right would eventually lead into Old Farleigh Road; and, to the left, would lead to the end of Selsdon Vale and the footpath running across it. 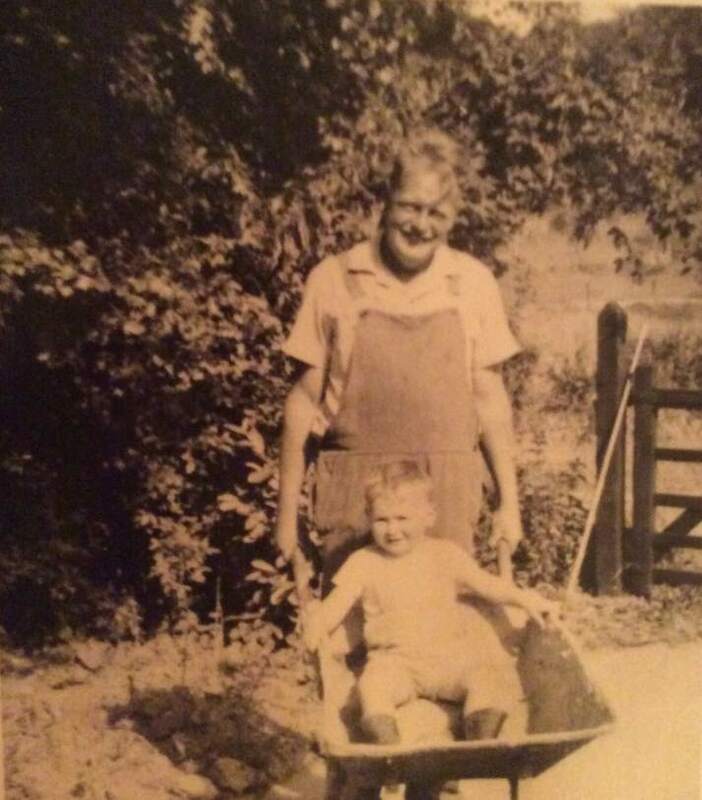 My father, Ralph (aka Bob) Glover and me (Steve) in the wheelbarrow, outside the same wooden gate in front of the house, probably taken sometime in the latter half of 1953. Chris Jennings, a contemporary who has provided his own memoir, added the following comments after reading Steve's account. It was interesting reading Steve's memoir. Our paths possibly crossed, especially down at the conker tree which drew many youngsters from the area and the footpath that he mentions was one of our speedway tracks for our 3 gear bikes. The ice cream van was a regular until about 1963. The milkman was also a regular in his three wheeled battery van right up to when we left. I used to help him from one end to the other for a bottle of orange. The Vale, although un-adopted, was run by the Vale Committee (who always seemed to meet at our house, the White Cottage). They eventually invested in a tractor and every six months or so The Vale was raked. The pot holes all but disappeared and it became a loose stone road surface but during the summer it became a dust bowl.